Training delivered by Sports Coach UK in partnership with the EFDS. Mark Walsham works in North East Derbyshire as an instructor for the Healthy Lifestyles team. He explains how the Inclusive Community Training (ICT) workshop in Chesterfield that he attend along with a colleague has helped them support people with disabilities to be physically active. "I am the Manager of the Healthy Lifestyles Instructor team in North East Derbyshire; the team involves coordinating and delivering activity for people of all ages, in particular those with medical problems. The team delivers exercise classes to disabled people that include chair based activity, low impact circuits, group cycling and gym sessions." Why did you attend the training? Boccia is a fully inclusive sport. "We wanted to broaden our knowledge on how to support disabled people and find out new activities that we could introduce into the activity that we already deliver. Before the course, I hadn't attended many other courses linked to disability inclusion or any sport specific courses". "The key skills that we gained from the workshop was how to match activity/games to the needs of the group that you are working with. We were shown a variety of ways that we could deliver a game or activity. This helped to understand how to make the activity level of a session appropriate to the group that are taking part. It will also help to be able to maintain the participants interest in my sessions my having more variety. Overall, what we have learnt from the training will help the quality of life of North East Derbyshire residents through appropriate activity and socialising with others." How have you put the training into practice? 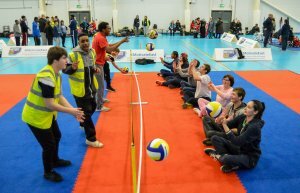 Sitting Volleyball is a great inclusive sport. "Since the training workshop, I have introduced New Age Kurling into our 'Forever Active' sessions that are aimed at the 60 plus age group. I have used the STEP (Space, Task, Equipment, People) tool that was learnt at the workshop to help to set appropriate activity level for each customer or group. The main impact that the training has had on the disabled people that I work with so far has been an increased variety of activities. The training has also helped to improve my confidence to deliver sports activities to disabled people". 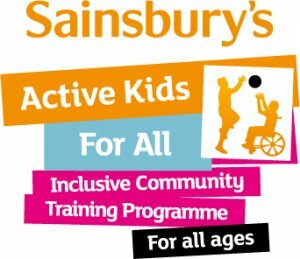 To find out more about the Inclusive Community Training workshop, visit the EFDS website.